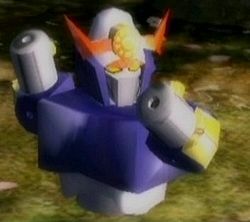 This article is about the blue robot toy that provides enhanced defense. For the red toy that provides fire invulnerability, see Forged Courage. The Justice Alloy (正義合金ジャスティスZ?, lit. : "Justice Alloy Justice-Z") is the top half of a blue and silver robot toy. It is found on the last sublevel (7) of the Snagret Hole, where it is held by a ferocious Pileated Snagret. Once this treasure is retrieved, he unlocks the Metal Suit Z, a member of the Exploration Kit. Although the Metal Suit Z returns in Pikmin 3, it is only an addon to the suit, and this treasure does not exist per se. This piece of treasure is relatively similar in appearance to Forged Courage. Like some other treasures, if the player defeats the Pileated Snagret, but does not have enough Pikmin to carry the Justice Alloy, which requires the strength of 20 Pikmin, it will change weight to match the player's army. “You've done it! That bird-beast will trouble you no more! Processing... How curious. What's that impressive, mechanized masterpiece? Brrrzzt! Does not compute! A metal this dense defies the fundamental laws of physics! Processing...complete. Fabrication of the Metal Suit Z is now concluded. The Metal Suit Z in the Snagret Hole. The Justice Alloy being analyzed. This treasure seems to have a similar appearance to some of the mechs in the Gundam series. It also has a resemblance to the main mechs from the Mazinger Z series. Its name, and that of the Metal Suit Z, may be a reference to the material that is used to construct these robots, Super-Alloy Z. This page was last edited on December 29, 2018, at 12:20.